Effective January 16, 2013, Iowa law requires that all students entering 7th grade receive a one-time booster of the Tdap (tetanus, diphtheria and pertussis) vaccine. This change is being implemented at the beginning of the 2013-14 school year. If your child already received the vaccine, parents will simply need to provide documentation to the school nurse. Pertussis (whooping cough) is a very contagious disease that causes violent coughing fits making it difficult to breathe. This important public health initiative not only protects your child from illness, but also prevents the spread of whooping cough which is particularly dangerous for babies, elderly and people with suppressed immune systems. In 2012, there were 1,647 cases of pertussis reported to the Iowa Department of Public Health, which is an increase of 417% from the previous year. Research has shown that the effectiveness of previous vaccines received as a young child diminishes as they get older, and by the time they reach adolescence they need a vaccine booster to increase their immunity. Tetanus, also known as “lockjaw”, causes painful muscle spasms, usually all over the body including tightening of the jaw so the person cannot open their mouth or swallow. Diphtheria can cause a thick covering in the back of the throat leading to breathing problems, paralysis or heart failure. 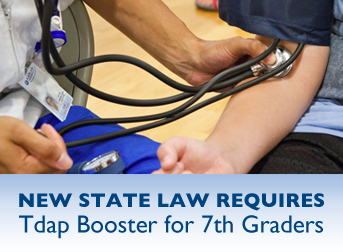 Although this requirement is only for students entering 7th grade, if you have older children who have not had the Tdap booster please check with your primary healthcare provider for recommendations on this or other immunizations. This vaccine generally produces no serious side-effects other than tenderness at the injection site and mild fever in some cases. As you are preparing for upcoming physicals for the next school year, please ask your primary healthcare provider about the Tdap booster vaccine. If you are without insurance, call Polk County Health Department for vaccinations at 286-3798. If you have any questions, please contact your school nurse or the DMPS Health Services Department at 242-7618.